Journal – a diary; a collection of thoughts/ideas. 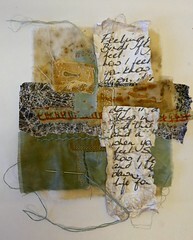 Quilts – a textile work comprising 3 layers. In the Contemporary section of the Quilters Guild we challenge each other to produce a small journal quilt each month, taking a theme for the year – sometimes of our choice; sometimes an element is required. Marion McCrindle will share her experience of making these quilts over the past eight years (not all of them!!) and make suggestions as to how we might adapt this to our own work.